It’s official – the Pats are Champions. It’s time to celebrate! New England fans, Uber is making it easier than ever for you to represent the Pats and look as good as the players after their big win, by delivering official on-field Trophy Collection gear from Fanatics, the global leader for licensed sports merchandise. Sporting Championship merchandise today is easy as a few taps of your smartphone. If you’re within the delivery zone in the metro Boston, Worcester, Providence and Manchester areas, and you’re matched with a car, you’ll get your custom fan gear delivered within minutes. Fans can order for their friends, family, or coworkers. Up to 10 purchasable items per request. Specific sizes are available on a first-come, first-serve basis. Demand will be high and availability is limited. Must be 18 or older to order. Merchandise sales are final. Items available on Sunday, 2/5 after the game in Boston only and on Monday, 2/6 from 10am – 4pm EST in Boston, Worcester, Providence and Manchester. 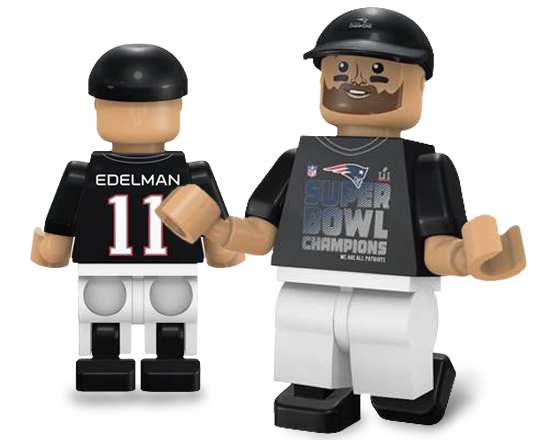 The first 100 fans to place an order will also receive a special Julian Edelman limited edition OYO Sports Championship figurine. If you are unable to connect, not to worry. Merchandise will be available for purchase online through the Patriots ProShop, the official store of your World Champion New England Patriots and Fanatics.com.